All of the current models offered in stores for the Swegway are only capable of traveling on a flat surface, such as a sidewalk. These products are not able to handle even the smallest of bumps. We have fixed this problem by designing, and making, the Rugged Two-Wheel, a transportation option that can handle challenging environments. The major changes that we made were to the shape of the body and the type of wheel. Our product is as simple and easy to use as the Swegway, but it vastly improves handling on different terrain. There have been multiple reports of people falling off of their Swegways when not on a smooth road; our product ensures users that they will stay in control, even when the riding gets rough. We set out to change the fact that the common person could not ride a Swegway over uneven areas. Even the slightest hazards could send the passenger flying off of the product. When we designed the Rugged Two-Wheel, we wanted to put the rider in the position of power. We did not want sticks or cracks in the road to be able to dictate the direction in which the rider traveled. Our vehicle has two, ten-inch diameter wheels to handle all terrain. Its body is also designed to travel over unforeseen obstacles. Underneath the foot stand, the body slants down to a smaller flat piece on the bottom. This angle allows the Rugged Two-Wheel to not get caught up on objects beneath it; instead, they just slide through. We used accelerometers to control speed and direction. All the rider has to do is to lean in the direction they want to go. To turn, the person has to put one foot in the forward position and the other in the backward position, so the wheels spin in opposite directions. Our project went relatively smoothly. We started off with a strong idea, and did not have to change much after making the initial plans. The hardest thing for us to accomplish was the electronics. We used an Arduino and motor controller to make the motors work. We did not know very much coding, so we had to learn as we went. The wheels were also a little tricky. It was hard to get them perfect, but eventually we were satisfied. In our first iteration, we modeled the whole body around the motors. We first cut out two board: one that our feet would go on , and a slightly smaller one that would would go beneath the motor. We then cut out pieces of wood that would encase the motor and also support the rest of the base. Theses pieces had notches that corresponded to notches in the two plates. We slanted the supports down to each base. Our product had two motors and two bases to allow the rider to pivot and turn. To make the pivoting action, we connected the two bases using a metal dowel. In order to do that, we added additional supports with holes in them that would fit the dowel. We also made an adapter to improve the connection between the wheel and the motor. We cut out pieces of wood that would attach to the motor connector, using screws, and to the wheel hub, using bolts. For control of the Rugged Two-Wheel, we used a potentiometer and an accelerometer. The axle was anchored into one of the bases so that it would not rotate in that base. It was then joined to the other half (where it could rotate) and a potentiometer was attached, using a 3D-printed adapter. As a result, when the user tilts one foot forward or backward, the potentiometer rotates and moves the motors in the desired direction. The accelerometer was utilized for traveling in a straight line. The rider leans forwards or backwards, and the Rugged Two-Wheel moves accordingly. In our second iteration, we made a few minor changes. We took away the potentiometer, and used two accelerometers instead. The movements for turning and changing speed were the same as before. We realized that the potentiometer would require too much coding time, and the accelerometers would still create our desired effect. We also added bearings to the axle, to make it sturdier and turn more easily. Collars were put around the axle, as well, to prevent it from coming out of the bases. The final change that we made in that round of development was to add semi-circular slits on the supports, allowing wires to pass through cleanly. In our third iteration, we added turntable bearings to the wheel mounts, in between the connections of the motor to the wheel and the base. This added stability and took the weight of the rider off of the motor axles. It also ensured that the wheels did not wobble too much and subsequently break. The Rugged Two-Wheel would work better with more powerful motors, but we have a strong prototype that captures our design goals. The objective of this project was to design a rugged, off-road version of the existing Two-Wheel personal vehicles. The existing Two-Wheel is designed solely for use on flat, open spaces where there are no obstacles or barriers to block its movement. Even large enough sidewalk cracks can cause the wheels to get stuck, resulting in the user falling off and getting injured. Designing a vehicle that integrates a different type of wheel was adopted as a possible solution. By increasing the surface area of the contact between the wheel and the ground, we were able to increase traction and thus stability. Round wheels only have one small point of contact at all times, while our design always has a flat surface between the ground and the wheel. We designed a Two-Wheel that is capable of traveling off-road and possibly carry packages. One of the problems we ran into with the wheel is that the measurements had to be exact because we had very little clearance in which to err. Sometimes it was hard to measure objects and build pieces around them because the measurements might have been inaccurate or the pieces may not have been cut with perfect precision. Also, when switching between materials (cardboard, thin wood, and thick wood), the spacing all got changed and pieces that had worked previously no longer functioned properly. Time was a problem during this project. With both of us working on separate parts, progress was somewhat slow. That combined with the three days missing people, meant that we missed quite a bit of time in the studio. Our wheel design is unconventional. It consists of four feet, each connected to the two main supports in the shape of an X. As the supports rotate, the feet move around in a circle, but they always remain horizontal. This allows the wheel to “walk” across terrain, climbing up obstacles that a standard wheel could not. The main body is split into two halves, one for each foot and wheel. They rotate on one-another, using a potentiometer to allow for steering control. It uses accelerometers to control acceleration. A motor sticks out of either end, connected to the wheels. The first iteration of the Two-Wheel involved the assembly of the right side of the vehicle. The body was made up of a hollow thin wood shell with compartments for a motor and battery. In this iteration the body had no moving parts, and there was no provision for attaching the left side. The wheel design involved two wheels with little feet held between them. They provide the flat contact with the ground. The main problem of this design was that the wheels made contact with the ground between the feet of the wheels. The second iteration of the body had an attachment mechanism for the two sides, as well as a lip to cover the mechanism and give the two pieces some friction. This version used thin wood for most of the body, but for added stability we chose to make the piece that held the two sides together out of twelve millimeter thick wood. This iteration used a bearing and a flange bolt to attach the two sides of the body, but we chose not to create the left side due to time constraints. For the wheels if the second Two-Wheel we changed the circle to a square design. This allowed the feet to be the only contact with the ground. The problem with this was that the corners where the feet attached to the square were also hitting the ground. We moved the foot attachment holes in, but this also decreased the clearance space between the feet when they rotated, allowing for very little error on the measurements for the holes and the feet, but we figured that it wouldn’t be a problem. Another problem was that the pieces needed to be held apart because the bolts that were used were too long and stuck out off the side, colliding with the edges and the squares, causing the wheel to be unable to move. The third iteration of the Two-Wheel was a complete model. We made both sides of the body out of thin wood, and glued them together unlike with the previous two versions. The bearing attachment mechanism was used to create an axis for the two sides to rotate on, and a 3d printed piece was used to hold the mechanism together. We used working motors in the third iteration, but we only had one battery, and the rest of the electronics were not wired up or programmed. The wheels for the third iteration included spacers to separate the pieces and allow for the bolts to pass without colliding with the edges. It also included the finalized frame that held the pieces together at just the right distance so that the squares would rotate on it without falling apart. The final iteration of the Two-Wheel body is the same as the third iteration, with thin wood walls and compartments for electronics, but minor changes have been made to ensure that the user has a great experience riding the vehicle. We have kept the same attachment mechanism to hold the two sides of the body together but there is now wood in between the pieces to give the mechanism greater friction, and to stop the sides from getting caught on each other. 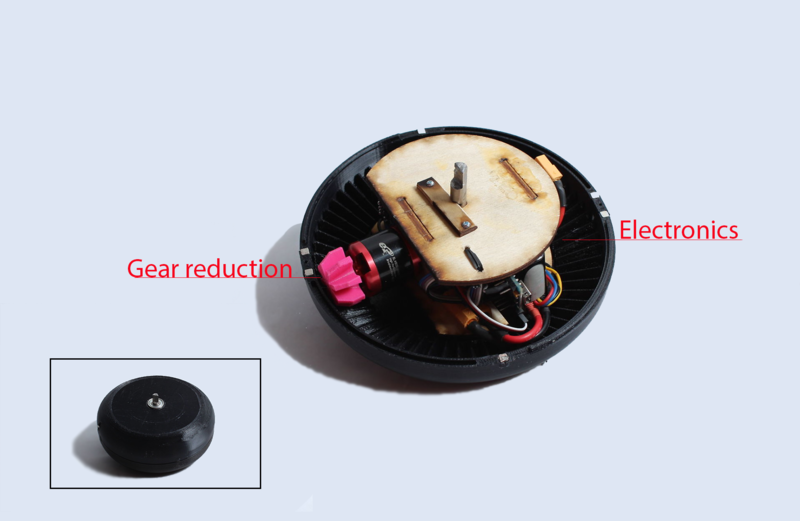 The battery holder has been flipped in order for the battery to be easily removed without destroying the Two-Wheel, and there is a potentiometer attached to the turning mechanism in order to sense when the user wants the vehicle to turn. An accelerometer and gyroscope sense which direction, and how far in that direction the user is leaning, allowing the Two-Wheel to move at multiple speeds, and to self-balance. Because of time and material constraints we were unable to create a Two-Wheel that can carry the weight if a human, but If we had more time to work on this project we would work on getting the Two-Wheel to support the weight of a human, as well as add the second battery that we were unable to put in. The final iteration of the wheels altered the square shape to be more like an X, which we had originally steered away from in favor of the more sturdy squares. This means that the structural integrity is somewhat reduced, but the modification was necessary in order to get to all the screws. An attachment to the main body of the Two-Wheel has been added as well. This allows for the motors to power the wheels, and for the wheel to be attached directly to the body of the Two-Wheel. Today went very smoothly. I was very happy about the progress we made; I did not think that we would get as far as we did. First, we planned everything out. We decided on using potentiometers and accelerometers for our sensors instead of pressure pads. We also talked a little about how to mount them to the body. We did a little of everything today, but we mainly focused on the body housing. We 3D modeled it, and then cut it out in thick wood. By the end of the day, we had all of the parts for one of the sides (not including the side covers). Tomorrow, I think we will assemble it and also cut out the other side. Dan is bringing in wheels that he has at home. They have a ten inch diameter, so they might be too big, but we wanted to test them out before we ordered something.